The QRNational 5000 class is used exclusivly to haul coal in the NSW Hunter Valley. QRNational and its subsidiaries are a unique success story for government operated rail, in a country where all other government operated rail freight services have been privatised with varying degrees of success. Wholly owned by the Queensland Government, QRNational was formed during the 2004/2005 financial year as the interstate freight operation arm of Queensland Rail (QR), the original government operation, transporting passengers and freight on the extensive narrow gauge (3ft 6inch) network in place in Queensland. It would be incorrect to assume that the creation of QRNational marked the entrance of QR into the domestic interstate and intrastate freight markets in NSW, Victoria, South Australia and Western Australia. The formation of Interail in May 2002, as a result of QR acquiring Casino based Northern Rivers Railroad (NRR), marked the entrance of QR into the recently deregulated standard gauge rail market in NSW. This would only be the beginning of a well planned move to transport freight from coast to coast of Australia, resulting in QRNational being one of the major players in the rail transport market today. With the purchase of NRR in May 2002, QR gained a number of standard gauge locomotives and rolling stock, as well as the opportunity to bid for contracts on the NSW standard gauge, especially in the lucrative Hunter Valley coal network. Prior to their acquisition by QR, NRR had previously transported freight on the now closed Casino to Murwillumbah line in conjunction with FreightCorp from their base of operations in the old locomotive depot at Casino. The first contract Interail held was to haul infrastructure trains on the North Coast Line, which extends from Maitland in the NSW Hunter Valley, as far north as Brisbane and the freight terminal at Acacia Ridge. Interail would also pick up a pair of contracts to haul coal in the Hunter Valley, first from the loader at Duralie to the washery at Stratford, and also between Newstan Colliery and the power station at Vales Point, both in 2003. Interail also ran a container service from Casino to Fishermans Island (Port of Brisbane) from May 2003. The locomotives purchased by QR in their takeover of NRR were a number of ex State Rail Authority locomotives in the form of the 421 and 422 class. 42103, 42105, 42107 and 42109 were the only operating members of their class when in service with NRR, as well as 42202 and 42206. These six locomotives would be supplemented by the regauging of six QR narrow gauge 1502 class locomotives, using the bogies from 49 class locomotives purchased from the State Rail Authority. 42301 and 42302 entered service on the standard gauge in 2002, with the remaining four members of the class entering service at a rate of two units per year in 2004 and 2005. The first four members of the class entered service in the original NRR/Interail colour scheme, with the final two units (42305 and 42306) wearing the corporate QRNational colour scheme of yellow and black. In addition to the introduction of the 423 class, two ex Western Australian Government Railways (WAGR) L Class were purchased from Rail Technical Support Group (RTS) in 2004 – L265 and L271. Prior to the sale of L265 to Interail/QRNational, L265 had seen use on Interail container and coal services on lease from RTS. Both units were soon painted in the striking Interail corporate scheme of yellow, orange and dark blue. During 2004, Interail/QRNational ran their first Brisbane to Melbourne and Sydney to Melbourne container services for Colin Rees Transport (CRT), replacing Freight Australia as the rail provider for CRT, using a combination of owned and leased motive power. These early container services were dominated by pairs of leased CFCLA EL Class, supplemented by the occasional GL class (also leased from CFCLA) or L Class as the need arose. By mid 2005, QRNational had absorbed CRT into their business structure, and from July 1st 2005, CRT was operating as a subsidiary of QRNational. This takeover also resulted in the transfer of two G Class and two third series X Class from CRT to QRNational (see below for more details on these locomotives), which were added to the “pool” of locomotives used on east coast freight services. CLP10 was one of ten CLF/CLP class transferred to QRNational intermodal services after the takeover of ARG. From mid 2005 to early 2006, east coast QRNational/Interail container services often included one other leased locomotive in the form of SRHC unit GM36, which, upon entering preservation, had been painted into the Commonwealth Railways scheme. By mid 2006, this unit was again off hire, with the introduction of CLP and CLF Class units to the east coast intermodal roster. Until 2005, the transport of coal from the NSW Hunter Valley to the ports at Newcastle was dominated by Pacific National with their extensive fleet of wagons and rolling stock, inherited from their purchase of National Rail and FreightCorp in 2002. However, the first of July 2005 marked the entrance of a new operator, and a new class of locomotive to the Hunter Valley coal haulage scene – QRNational with their new 5000 class locomotives. Based on the successful NR Class design that United Goninan’s built for National Rail, the 5000 class was to be the heaviest locomotive operating outside of the Pilbara region in WA, and allowed QRNational to pick up mainline export coal contracts in the lucrative Hunter Valley coal network. In the weeks leading up to the introduction of the 5000 class, the QHAH hoppers were hauled by combinations of EL, L, 422 and 423 class locomotives – quite an impressive sight indeed, as it is not often that one sees vintage motive power hauling the heavy coal trains of the Hunter Valley. With the division of Australian Railroad Group (ARG) in February 2006, and the subsequent sale of their NSW and WA rolling stock, customers, contracts and operating depots to QRNational, QRN gained a lot of additional rolling stock and motive power to use on their intermodal trains, most notably the CLP and CLF Class, originally in ARG service, but transferred to the intermodal division. At this point, L265 and L271 returned from intermodal and coal working to join the other L (31) class working in WA and NSW under ARG/QRN ownership. The introduction of the CLP and CLF Class units also freed up leased motive power for work elsewhere, or to be released from QRN service altogether. G516 was to be used with G534 for east-west intermodal services, but this duty went to leased motive power. 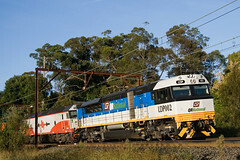 G516 is seen here leading two CLP class north through Menangle with MB7. Not content simply to run intermodal services on the east coast, QRNational would run their first east west intermodal services between Melbourne and Adelaide during 2006, before running as far as Perth during 2007. The original idea was to use the two G Class (G516 and G534), but this did not last long before they again turned to the use of leased motive power in the form of CFCLA motive power EL, and later, as they were introduced, the RL and VL classes, as well as hired motive power from Genesee and Wyoming Australia (GWA), including GM12 class locomotives. When Specialised Container Transport (SCT) introduced their 15 strong SCT Class (build by Downer EDI at Cardiff, NSW), their fleet of 9 G Class, all wearing their vibrant colour scheme of red and white (most with SCT logos) became surplus. These 9 G Class units then became available for hire, with QRNational hiring G511, G513, G521, G533 and G535 over late 2008/early 2009. These units supplemented G516 and G534, and for a number of months it would not be uncommon for east coast intermodal services to be lead by one of the seven G Class, with two or three CLP/CLF class assisting. It was thought that the G Class were preferred as lead units due to less obstructed vision from the cab, as well as the SCT G Class having been refurbished recently, with the view to using them on Parkes/Melbourne to Adelaide and Perth services for SCT. Pacific Nationals slow withdrawal from operation in Victoria left a number of gaps in the market for short haul container and grain services, some of which were picked up by El Zorro. One contract that was successfully passed to QRNational was a one year contract (with option for renewal) for the transport of containers on behalf of Wimmera Container Line, during July 2008, between their depot at Horsham, and Melbourne. SCT owned G521 is on hire to QRNational in this scene captured at Adamstown. G521, 42107 and 42301 are Sydney bound with 4152 freight. In their quest to win business from Pacific National (QRNational are operating in direct competition with PN on their east coast and east-west intermodal services), QRNational needed to invest in new, modern motive power to compete against the 119 strong NR Class fleet operated by Pacific National. When Downer EDI Rail announced that they would be entering the leasing market with an initial construction of 9 “LDP Class” at their Cardiff works, it was also announced that QRNational had secured an initial five year lease on all nine units, with an option to renew for a further five years. 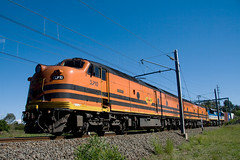 The LDP Class were introduced on east coast intermodal services during March 2009, and now form the staple motive power on Melbourne/Brisbane container working, usually operating in pairs. 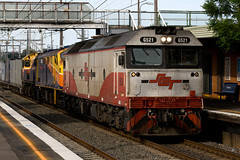 Single LDP Class locomotives have also been used to supplement the CLP/CLF/G Class locomotives between Melbourne and Adelaide, pending the introduction of the 6000 class (built by United Goninan’s) on these services. Now, as QRNational steamrolls through 2009, Queensland Premier Anna Bligh announced on June 2nd that a number of QR business divisions would be sold, which would end a 144 year history of a fully integrated passenger and freight organisation, still in government hands. Colin Rees Transport (CRT) began life as a taxi truck company in Sydney’s western suburbs, during the 1950’s. By 1981, CRT had become CRT Group, and had terminals all around Australia, including two with their own railway sidings – one at Altona in Melbourne, and the other in Yennora, in western Sydney. CRT Group also owned a number of their own locomotives for shunting their terminals, from the diminutive ex-SRA X100 and X200 class rail tractors (X101, X107, X118, X208, X209 and X216) as well as three comparatively larger ex SRA 73 Class in the form of 7322, 7333 and 7334. CRT Group also introduced the first European designed CargoSprinter unit to Australia, in February 2002, which for a short time operated container shuttles for CRT in Victoria. CRT Group also makes available to their customers their own low profile 30ft containers. In the final days of the SM/MS9 service, motive power would commonly be limited to a single G Class, such as at Douglas Park one friday as G535 blasts south with 6SM9. The original provider of rail transport between CRT terminals was Freight Australia, who ran a dedicated freight service between Yennora and Altona until their sale to Pacific National in 2000. 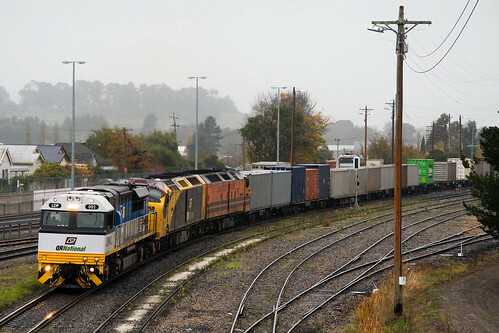 Included in the sale was a clause that if Freight Australia were ever sold, 10,000hp worth of motive power would pass to CRT to be used for interstate services. In late 2004, this resulted in the passing of ex Freight Australia G Class units G516 and G534, and ex Freight Australia third series X Class units X53 and X54 from Pacific National to CRT Group. QRNational then inherited the units when they acquired CRT Group in early/mid 2005. CRT Group now operates as a subsidiary of QRNational in 2009, with 12 terminals around Australia. Loading between Melbourne and Sydney is still conveyed by Interail/QRNational trains, although a dedicated train has not run since the end of 2008. Now the loading from the CRT Terminal at Yennora is railed to the old Glenlee washery site, where it is shunted onto the Brisbane – Melbourne/Melbourne – Brisbane train, and the loading for Sydney from Brisbane/Melbourne taken off the train, and taken back to Yennora in the evening. Previously this shunt had occurred at Broadmeadow with train 1451/4152 running between Yennora and Broadmeadow. This was replaced in 2009 with the Glenlee train as mentioned above, running as train 1251/2154. For the full story on the operation of Australian Railroad Group in NSW, please click on over to the ARG section of Trackside. When Wesfarmers offered up their portion of Australian Railroad Group for sale in February 2006, QRNational launched a $446 million bid to purchase the rolling stock, depots and contracts of ARG in Western Australia and NSW. The South Australian assets were retained by Genesee and Wyoming, and rebadged to operate under the banner of Genesee and Wyoming Australia. The acquisition of ARG added a number of members of the CLF, CLP, 22 and L Class units to the QRNational fleet in NSW. The CLF and CLP class would be transferred to intermodal workings for QRNational, while the two QRNational L Class would be transferred to ARG working. L271 was sent back to its home state of Western Australia, while L265 continued on in Interail colours on Manildra trains in NSW, before being sent back to WA with the rest of the ARG fleet, after the withdrawal of ARG from NSW operation in 2008. 421 Class – 42103*, 42105, 42107 and 42109 are all operational on trip services, or as shunters at container yards. 422 Class – 42202 and 42206 are both operational, both recently used as shunters. 423 Class – 42101, 42302, 42303, 42304, 42305* and 42306* are all listed as operational, although some units may occasionally be put into storage with the Newstan to Vales Point contract having ceased in mid to late 2008 reducing their use. 73 Class – none of these units are in service in NSW at this time. X Class – Both X53* and X54* are in service following repainting, and are operating in the Sydney area on trip trains. G Class – G516* and G534* are both in service on east-west intermodal services. CLF Class – CLF1 recently spent some time with P&O Trans Australia on hire, although this unit has been returned to QRNational as of August 2009. CLF2 and CLF3 are reportedly in storage requiring work done. CLF4 and CLF7 are both in service on east/west intermodal services. CLP Class – Following a short stint on hire to P&O Trans Australia, CLP11* and CLP13* are back in service on east/west intermodal services. CLP9, CLP10 and CLP12 also continue to see use on east/west intermodal services. 5000 Class* – All fifteen members of the class are in service on Hunter Valley coal traffic, with one unit being rotated into United Goninan’s for regular servicing when required. Units operate in pairs on rakes of QHAH 120t (gross) coal hoppers. LDP Class – Despite not being owned by QRNational, the first 9 units are on long term lease (see above). LDP001, LDP002 and LDP003 are in the Downer EDI/Locomotive Demand Power livery of blue and white, with QRNational logos. LDP004 to LDP009 are outshopped in the QRNational corporate “eagle” scheme. 6000 Class – Similar to the 92 and AC Class, the 6000 class were built for QRNationals Melbourne to Perth container services, although a number of units are currently in use in The Hunter Valley, to supplement the 5000 class on coal services. LDP002 is assisted by hired G513 and QRNational owned CLP9 at the start of their descent down Cowan Bank. Obviously this list is subject to change, and may not be up to date; however the list is as up to date as possible at the time of writing. As well as leasing a number of container flats from CFCLA, QRNational also owns and operates a number of wagons. The QHAH 120t (gross) hoppers are used on QRNational export coal operations in the Hunter Valley behind two 5000 class locomotives. Built by United Goninan’s, they were introduced alongside the 5000 class in 2004, and are used exclusivly with the 5000 class in export coal traffic in the Hunter Valley. The QHAF and QHBF 76t (gross) hoppers are used on Interail/QRNational domestic coal operations between Duralie and Stratford, and until the cessation of the contract in 2008, on the Newstan to Vales Point coal services. A number of the hoppers are now stored, pending further use. The QHAF hoppers were originally narrow gauge VO class hoppers. The QQAY container flats are all ex narrow gauge container wagons, regauged to standard gauge. The QQFY, QQJY, QQMY and QQXY wagons are all ex National Rail/Pacific National container flats. The QQGY, QQKY and QQTY wagons are all ex Victorian container flats. The QQLY, QQOY, QQPY, QQQY and QQRY wagons were all acquired as part of the sale of ARG to QRNational, and rebadged accordingly. Thanks also to Greg Gordon, Tim Gray and Maikha Ly for their wisdom and assistance in compiling this page.